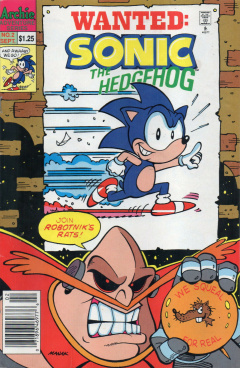 Sonic the Hedgehog 2 is the second issue of the Sonic the Hedgehog comic series. It was released in September 1993. This comic features five stories: Triple Trouble, Vertigo A Go-Go, Foiled Again, Two Timer and All the Mail's About Tails! 4 All the Mail's About Tails! Dr. Robotnik is playing darts with a dart board that has Sonic's face on it, when Crabmeat comes up to him saying he'll defeat Sonic. Instead of listening to Crabmeat, he throws him at his new robot, Coconuts, who chucks a coconut bomb destroying him. After seeing the successful destruction of Crabmeat, he orders Coconuts to go after, and defeat, Sonic the Hedgehog. Back in Robotnik's lair, a swatbot arrives with a large package. He rips it open gleefully, hoping to see clothing, only to realize it's full of Coconuts' parts, all broken. Aside, Scratch and Grounder, seeing the broken Coconuts, decides to take on the job of defeating Sonic themselves. Robotnik agrees, in his rage to defeat Sonic, and sends them out, noting he'll keep in contact with them. Just as they leave the room, Robotnik calls to remind them the price of failure, but Scratch answers noting that they're on a secret mission and don't want to be disturbed. Robotnik replies in anger, choking Scratch through the comic slides. On their way to the Great Forest, the duo are looking for a deep chasm left by Sonic, only to have Grounder fall into one. Using his arms as propellers, he exits the chasm and they follow it, hoping to find Sonic, who is hiding behind a tree with Tails. They reach the end of the chasm, which is at a cliff edge. Sonic jumps out, ripping the cliff in a spindash and causing the duo to fall. Although Grounder is able to deploy parachutes with his hands, Scratch falls to the bottom with a bang. Sonic looks down on the two, telling them to return to Robotnik, but the two robots haven't finished yet. Grounder launches a rope from one of his hands and ties up Sonic, pulling him to the bottom of the cliff with them. Now with Sonic in their grasp, Scratch decides to take the glory for Sonic's capture, angering Grounder. They start fighting, not realizing Sonic has come to and removed the rope. He spindashes around the two after they finish fighting, weakening the ground around them. They fall into the ground and get stuck, while Sonic grabs Grounder's hands to call Robotnik. He tells Robotnik that his robots are not available, angering Robotnik who proclaims "I hate that hedgehog!". Sonic dashes away from the robot duo, with another victory. Sonic is rushing along, collecting rings to aid in his fight against Robotnik. He comes upon an odd cluster of 8 rings, stopping on a spring hidden in the ground. The spring launches him into the sky, into a long, colorful tube. He exits the tube into a disorienting world inhabited by two men named Verti Cal (a man who only exists upside down or right-side up) and Horizont Al (a man who only exists sideways). Sonic, in his confusion, falls into another hole, entering some psychedelic tubes, asking the two men for help, but confuses their names. He exits the tube upside down and demands if the men work for Robotnik, however, the two men aren't even aware of him. In anger, he tries to enter a spindash, but becomes disoriented and falls into another hole. He enters another room where there is no color, realizing that Cal and Al really don't know of Robotnik, thus surmising that he entered an unknown zone by collecting all the rings. He falls into another colorful tube, with Al telling him magic rings are dangerous to play with. The two men wish Sonic adieu as he falls down a tube leading out of the zone. Sonic asks if they will meet Princess Sally, but they ignore him as he hits the ground in the real world infront of Antoine D'Coolette, losing the rings he collected. Antoine asks Sonic what's 'up', making Sonic mad and he starts chasing him. Sally asks Sonic to wait with her, but with his speed, he wants to help out more around Knothole Village. He runs around cleaning the floors from the Freedom Fighter parade, repairs holes left by a Burrobot invasion, and delivers 200 issues of the Knothole Herald. All that, to return to Sally finishing up cooking a two-minute egg. All the Mail's About Tails! In an attempt to explain Tails' two-tail mystery, Sonic presents a series of supposed explanations for the reason why Tails has multiple tails by comic readers. Tails' ancestor was owned by Charles Dickens, with the ancestor recommending the title 'A Tails of Two Cities'. Tails is a mutant, similar to that from X-Men, with Tails even going to Charles Xavier. Tails was a loss leader of a circus freak show, alongside a bearded lady, a witch doctor and a unicorn. Tails was created by Dr. Frankenstein. Tails' second tail is actually Antoine's. One reader used a theory of evolution that confused Sonic. Despite the different theories, Tails mentions that he should have his own 3-issue miniseries. Sonic, meanwhile, pulls up a letter of his own, with a reader asking why he's always naked. A one-page segment, 'In the Beginning', depicts Sonic the Hedgehog in different forms: Chronic the Hedgehog, Philharmonic the Hedgehog, Moronic the Hedgehog, Histrionic the Hedgehog, Hydroponic the Hedgehog and Stereophonic the Hedgehog. A one-page segment, 'Foiled Again', has Sally and Boomer with tin foil, asking Sonic to sit on a stool. The two grab the foil and ram into Sonic with it, leaving an impression. They put it down, noting it's for a foil embossed comic cover. A disoriented Sonic shows dissatisfaction when Boomer tells him there's 74,999 left to do. Two pages had supposed Sonic and Sally Pin-Ups, only to have each one stolen secretly by the other character. In All the Mail's About Tails, Dr. Frankenstein's name is mistakenly spelled Dr. Frankenstain. The 3-issue miniseries Tails eludes about in All the Mail's About Tails was actually created.